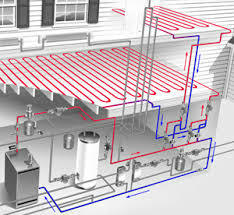 In-floor heating provides the most comfortable interior heating imaginable. The heat is even throughout a room, radiating from the floor where people are, rather than blowing around the ceiling. There are no fans or blowers, so the system is quiet and clean. There are no drafts and if you store machinery used outside, the cold from the machinery is not circulated through the room. What’s more, in-floor heating will save you money. Water has a much greater ability to transport heat, so it can heat a room using less energy than forced air. Instead of large fans blowing warm air all day, the warm water is moved with small pumps. Porter’s Refrigeration – Call Us Today 613-659-4775 for a FREE In-Home Consultation.